Install the latest .NET Core SDK from here (you should get a dotnet-sdk-xxxxx.exe). After setting up .NET Core SDK, we will need to install an IDE. The IDE provides us an environment where we can code our plugins. You can install install Visual Studio Code with the Omnisharp extension for developing plugins. Visual Studio Code is much lightweighter and faster then a full Visual Studio installation. It is optimal for small-mid size projects. If you want a full IDE experience, download and install Visual Studio Community Edition. 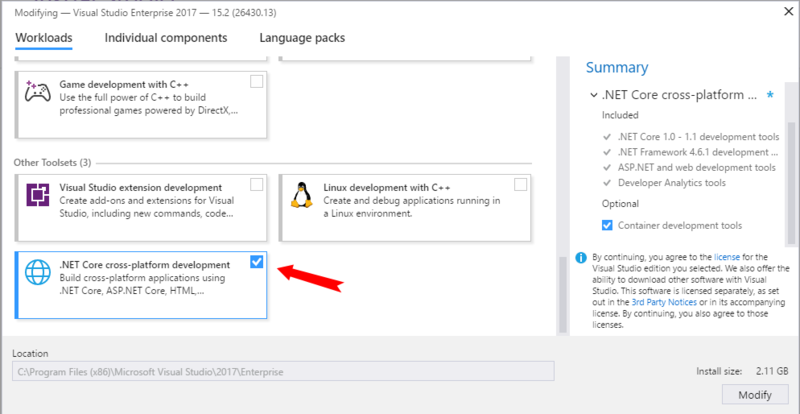 When the installer starts, select "Visual Studio 2017 Community Edition" (or newer). After that select the .NET Core cross-platform development and the .NET Desktop Development options like shown below. Start cmd or Powershell and navigate to the folder where you want to create the plugin project. To get more information about Rocket Plugin Templates, visit Rocket.Templates on GitHub. First create a new ".NET Standard Cross Platform Library" in Visual Studio. This should remove the previous error warning. Any variables added to this class will be configurable by the plugin user. We pass our config through the constructor so it can later be used when we handle the event, in this case our event is simply sending a welcome message to the connected user. The plugin is now done and it should look something like this. You can now build the plugin and upload it to your testing server. Only reference game specific packages (e.g. Rocket.Unturned) if you really need to access the game's API. If you only reference Rocket.Core and Rocket.API, your plugin will directly work on any game that supports RocketMod. Such plugins are called universal plugins. Do not use static plugin instances, instead always pass instances by reference. The reason for that is that Rocket can dynamically create and destroy your plugin instances, which could result in wrong instances being used.